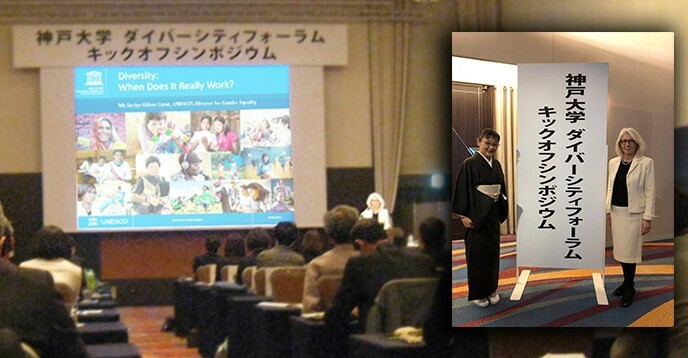 Ms Saniye Gülser Corat, UNESCO’s Director for Gender Equality, was invited to the Kobe University Diversity Program Kick-Off Symposium, held on 27 March 2019, and gave a talk on “Diversity: When Does it Really Work?”. The symposium opened with welcome remarks by Professor Hiroshi Takeda, President of the University, followed by a presentation introducing the Diversity Program by Professor Kazunori Uchida, Executive Vice President for Public Relations and Community Cooperation and Vice President in Charge of Gender Equality at Kobe University. In her presentation, Ms Corat briefly mentioned the benefits of diversity in teaching, research and for students followed by some of the challenges of implementing diversity measures that cause some programs to fail. Ms Corat then listed the elements of a framework derived from good practices for diversity. These included (i) making a compelling case for gender diversity through the collection of quantitative and qualitative data, (ii) critical analysis of this data to identify reasons for exclusion and under-representation; (iii) development of a time-bound action plan that addresses each of these reasons, and (iv) continuous monitoring and follow-through. To conclude, she emphasized the importance of transparency and honesty throughout this process. Professor Junko Okada from the Gender Equality Office of Kobe University then invited Ms Kumiko Bando, President of Japan Legal Support Center, to the podium. Ms Banda talked about gender equality issues in Japan with a focus on universities. The last speaker of the Symposium was Ms Hiroko Miyano from the private sector. Kobe University has proven to be a strong ally for gender equality. They launched the first UNESCO Chair for Gender and Vulnerability in Disaster Risk Reduction in April 2018. This new initiatives on diversity aims to increase the number of women researchers and faculty at the university as well as female students in science-related disciplines.